Q. How Do I Make RS-485 Connections? Figure 1 applies to many Ethernet/Serial Servers and some B+B SmartWorx RS-485 converters such as Models 485SD9TB, 485SD9R and 485SD9RJ. Figure applies to several B+B SmartWorx converters such as Models 485LDRC,485LDRC9 and 4WSD9R. Two switches are set for 2W or to 2-wire RS-485 Mode. Figure 3 applies to most B+B SmartWorx RS-485 converters that can be set for 2-wire or 4-wireoperation, and for some 2-wire converters that use the same circuit board for the RS-422 model.Check the data sheet schematic or block diagram. Figure 3 is also used for Repeaters/OpticalIsolated Repeaters such as the 485RPTR, 485OP, 485OPDR. An RS-422 device does not tri-state thetransmitter, so it cannot use these connections. Figure 4: This connection is used for a single Master in a 4-wire system. 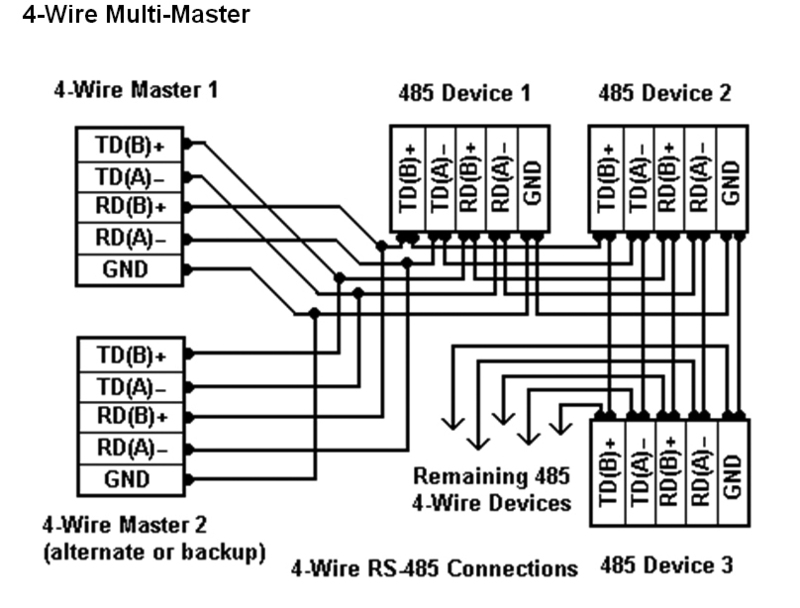 When only one master isused, the Master can be set to RS-422 mode since the there is no need to share the transmit wire pairto the Receivers of all the devices. All of the devices must be RS-485 and Tri-state since the samewire pair to the Receiver must be shared by the Transmitters of all the devices. 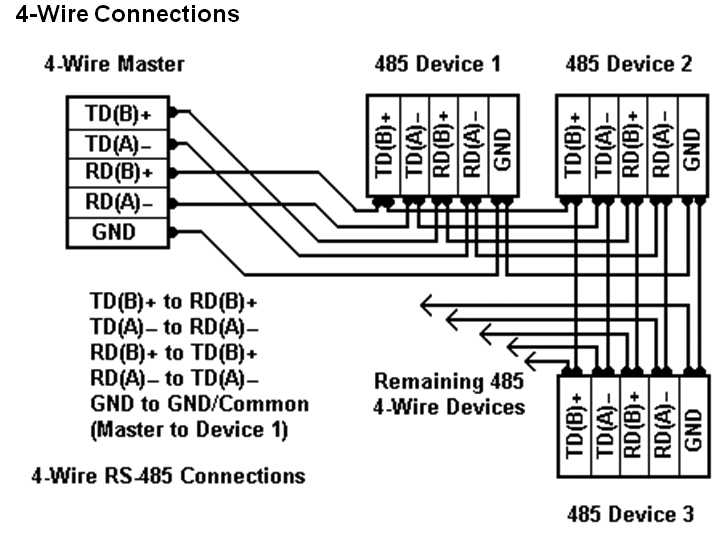 The advantage of the4-wire connection is that all devices only see commands from the Master, and no device sees theresponses from other devices.Turn-around delay is also not required. Connect additional Masters the same as any Device, (Figures 1-3) matching the polarity of the A and B data lines. All devices must be able to ignore the commands to other devices and able to ignore the responses from other devices. Any device could transmit to all others if permitted or some special protocol is established to avoid data collisions. Usually, the devices are Slave type and respond only to requests from a Master device. Figure 5 – This connection is less common – Master 2 may be anywhere else on the network and may beused for collecting data returned from the devices. It can monitor the data from the devices only, but is notable to monitor the data requests from the other Master without additional connections. Only one Master cantalk to the devices at a time, so one Master must stop transmitting for a time (to avoid data collisions) so theother Master can access the same devices, or use some software protocol established for device sharing.When Master 2 is used as backup, the program on Master 2 begins polling the devices when the Slavedevices stop responding for a predetermined time. Note on RS-485 Pinout Markings: Sometimes a device will be marked with the polarity reversed from normal RS-485 standards where the Data A or TD(A)/RD(A) line is (+) and the Data B line or TD(B)/RD(B) is(-). In a system with 2-wire connections, try reversing the lines to see if the device will respond. In a system with 4-wire connections, try reversing the Receive pair polarity and Transmit pair polarity. If the connections are wrong, you won’t be able to communicate because the data bits are upside down, but swapping polarity won’t damage anything. The marking Rx or Tx may be used instead of TD and RD or in a 2-wire system,Tx, Rx+ and TxRx-, or Dx+ and Dx- for the data lines. Many naming schemes are in use. RS-485 pinouts also have many variations and there is no single standard pinout arrangement or connector type – DB9, DB15, DB25, RJ-11, RJ-12, RJ-45 or DIN connector.